Advice on website design…….from the government?!? Perhaps you are as surprised as I was when I stumbled across a unique website created by the United States government that provides useful advice on website design tips, tricks and tools? The website is Usability.gov, which is run by the United States Department of Health and Human Services. I knew this website was a break from the norm when the first title on the homepage reads, “Please don’t make me think!” Along similar lines, the color scheme is vastly different from other government websites I have seen. Instead of relying upon blue hues and shades of white, which tends to be standard government website fare, there is an abundance of orange, raspberry purple, teal, yellow and white. Certainly this is not what I would have expected to see prior to visiting this site. I find this website encouraging for a variety of reasons. Needless to say, this website is a great resource for presenting and understanding basic website design principles. What really surprises me, besides the fact this information is coming from the United States government, is that this website is not more prominently marketed. I for one had no idea this resource existed online. Did you? There are many websites that could benefit from the principles and resources discussed on this site, regardless if they are public or private sector related. I clicked on the Analyze Current Site option and was presented with six sub-topics, each presented in short one or two sentence summations with an accompanying link for further information. This is designed well as it is easy to read and does not represent a cognitive overload. At this point, I decided to explore the Personas sub-topic. Clicking on the link loads a page with short but clear explanation of key aspects related to analyzing online user personas. 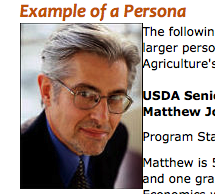 At the bottom of the page, a real example of a user persona is presented from the United States Department of Agriculture’s Economic Research Service. Additionally, the side bar contains several additional real government agency examples of user personas that can be downloaded as Microsoft Word documents. The information contained on this page alone is insightful and very relevant. Many people complain or assume that the government operates under a veil or secrecy and the public has no idea what really is going on within the halls of power. 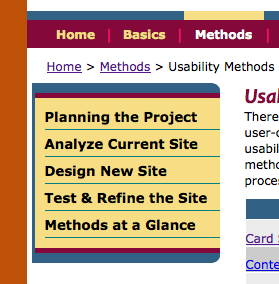 To that I say, explore Usability.gov. Here there are not just examples outlining how government entities establish and refine their online presence to better serve constituents but great tools that private individuals can use to make their own personal website more user friendly. As mentioned earlier, I hope this website gets more publicity, it certainly has earned it. Hopefully, my blog post will divert some folks to look into this resource. Thanks for your concern regarding website. This is quite a shock to me as well! Government bodies have some *horribly* designed/outdated websites (http://www.fbi.gov/ http://www.supremecourtus.gov/ http://www.fws.gov/ are good examples). With Obama being such a supporter of social media and technology in general, I would love to see some of the stimulus money spent on updating government sites that desperately need it. I’m appalled that the US Supreme Court website — which represents one of our government’s most fundamental bodies — is so horribly outdated. And its a shame that our national parks have no official web presence beyond a simple page on the National Park Service website (see Yellowstone’s listing at http://www.nps.gov/yell/index.htm). With all of the advances in social media, broadband technology, and everything else that’s been invented since 1995, I find that in many instances the government is largely ignoring the web.